Consultations are our first service appointment. Actual prices & quotes will be given at your consult appointment. AMAZING!! That’s the only word I can think of to describe Ann Marie!! I had hair extensions done and I left The Loft feeling great! This morning I left for work feeling confident and looking good!! Ann Marie is so knowledgeable about what she does. My hair had a few different shades of blonde and even some brown. Ann Marie customized each extension so that it would flawlessly blend with my color. You can’t tell the different between the extensions and my natural hair. She makes you feel comfortable and is so easy to gab with! By the time I got home I already had an email with aftercare instructions and when I woke up this morning I had an email with a how-to for each of the products I went home with. A cheat sheet that I can use until I’m familiar with them. As a bonus Ann Marie is inspiring!! She has the best stories and you can tell that she absolutely loves what she does. Her patience and attention to detail is astounding. I did a lot of research before I decided to go ahead with extensions and everything I came up with pointed to The Loft. Thank you, Ann Marie!!! 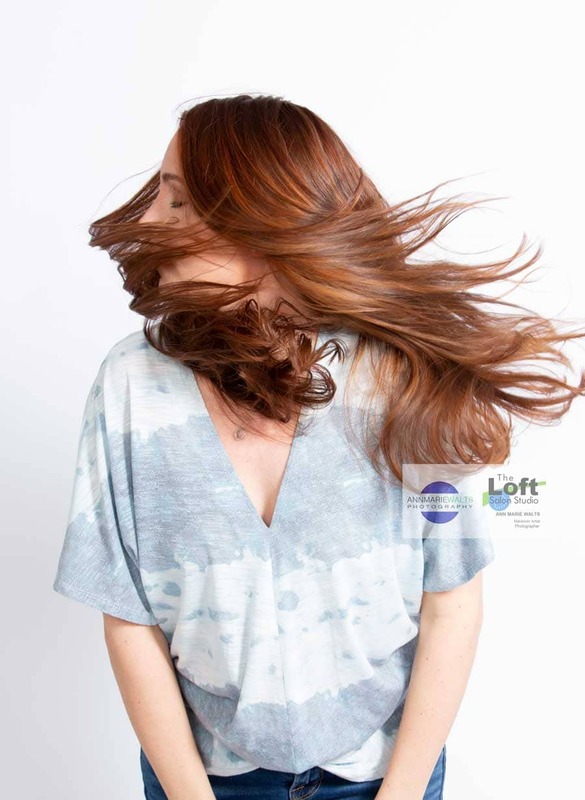 “I found The Loft Salon studio during an on-line search while considering Hair Extensions. I’m from the Northern, CT area and I was planning to visit NYC or Boston for this service. However, I was able to see pictures of actual extension work on her site, and I planned a visit for a consultation as I was impressed to see such great work locally, without having to travel several hours. I had a consult for extensions which was very thorough, included a written questionnaire, and I was able to see examples of different techniques. I was happy to find that Ann-Marie was certified in several different methods of hair extensions and was genuine in her recommendation of which method would best suit my need and hair type. I have now had three services, Hair Color, Japanese Straightening and Hair Extensions from The Loft Salon and Studio. I drive to NY to get my hair colored normally, and I do not have a local person, since I have had a long relationship with my colorist. To be honest, I was more than a little nervous trusting someone new. I am happy to say that Ann-Marie has a very special eye for color. Ann-Marie was just proving a touch up to cover new growth, so it was critical that she matched what I already had. She spent a lot of time carefully comparing my hair and available colors. To my surprise, she did a perfect job, and my base color and highlights were exactly right. I am not sure how hard it is to do this without knowing the brand, or colors used previously, but it was no problem for Ann-Marie. Secondly, a straightening process was recommended for my hair prior to extensions. I have chemically straightened my hair in the past, but never by the process that Ann-Marie suggested. I did a lot of research about the products, process and results prior to my service. Ann-Marie also did a great job here, my hair turned out as expected, and as she promised, I did have more time in the morning, now that I did not have to flat iron. I noticed that she was very careful during the process, and followed every step, to ensure a good outcome. Lastly, she installed my extensions. She did a fabulous job. I work in a corporate environment, and the length was quite a change. But the real test were my kids. She matched my hair color by expertly using (4) different extension colors, added highlights to extend my own, and it looked so natural that my kids, did not notice when I came home! Everyone has had positive comments. It will involve a full assessment of your hair’s health, texture and current hair color. This is a very detailed appointment. The purpose of this appointment is to set you up with what to expect for proper maintenance, aftercare, & actual price. Our hourly pricing model includes all portions of the color treatment necessary for each job. Such as protein treatments, reconstruction, glossing, foiling, and anything needed to assist a client to get to their end goal. You haircut consultation experience will focus on what your needs and your long term goals are for your hair. We will assess your hair type, and professional set you up for styling success. We are extraordinarily passionate about believing that a haircut is a the cornerstone to an awesome makeover experience. A fabulous haircut can be a makeover in itself. Test Application: We will apply 3 to 5 extensions to each lash as a “test”. From there, we will book your full set. Why? We want to ensure that you are completely compatible with our extensions, and that this service will work for you. The purpose of this consultation is to assess your lash styling needs, educate you on the procedure, and to show you the various type of extension options we have. We offer two types of professional applications & have been certified/ featured by 2 of the leading companies on the market. Xtreme Lashes & Bella Lashes. This appointment is also necessary if your are coming from another lash stylist. We are not able to provide maintenance (lash fills) on work that we did not originally provide. We do offer a complimentary removal when you get a new full set by us. There are limitless options with various thicknesses of extensions, and various curvatures! We provide our makeup application/ trial or lesson services, at our photography location, in Chicopee, Ma. We love sharing “how to” tips, so you can duplicate some or most of your professional experience. To book this, simple use the button below, and we will follow up with more information. Enjoy a private appointment, and get treated like a celebrity. We have been fortunate have our work/manicures published in Fashion Magazines, have worked on Celebrity shoots (for manicures), and can provide to you an impeccable polish job! Planning a bridal look is a very exciting and personal time. This consultation is to discuss your hair & beauty goals. Be sure to bring in photos of ideas of the feeling that you would like you hair to express. From there we will be able to book any future Bridal Trials. We do not offer pricing without a consultation because we customize all of our work. Please call or email us at info@annmariewaltsphotography.com for details of what you need. Brow extensions are applied one at a time. They can fill your sparse spots from over plucking or define your natural brow line.